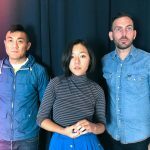 In case you didn’t notice our earlier Best of Indiepop, we’re huge Fanclub fans over at ATH, which says a lot considering the band’s a pretty fresh face on the Austin scene. But, those who loved Letting Up Despite Great Faults complete understand where we’re coming from, don’t you? If you’re new to the band, just let the synth lines that open this track pulse through your speaker; they hit heavy, almost forcing a nice foot-stomping dance move. Of course, the perfect dose of pop sensibility is a blend of the light jangling guitars matched with singer Leslie’s softly curled vocal notes. I love how the beat hits hard at the end, fighting Leslie for your attention; it’s beautifully cacophonous. The band will be dropping their debut All the Same EP this coming January via Friendly Reminder, so if you’re ready to start a fanclub for Fanclub, you just let me know!